The F3F was the last biplane fighter to enter service with the US Navy. The first F3F model entered service in 1936, and was replaced by the F4F Wildcat in 1940. Interestingly, the F3F series did not carry a “cat” name, as the later fighters from Grumman did. As the last of a breed, the F3F-3 had the distinction of being the world’s fastest ship-based biplane fighter. The first of 54 F3F-1 fighters entered service in 1936. They were followed by 81 F3F-2 models, which featured a more powerful engine and improved performance. In 1938 an additional 27 F3F-3s joined the Navy. The F3F-3 was virtually the same as the –2 model externally, but featured an up-rated Wright Cyclone engine. The US Navy fighters carried some very colorful schemes. The aircraft were finished with light grey fuselages, and silver-doped wings. The top wing surface were finished in chrome yellow paint, in part to make it easier to locate the pilot if an aircraft was forced to ditch at sea. The tails of the aircraft were painted in bright colors, to indicate which carrier they were from. Bright red tails meant a aircraft from Yorktown, Blue meant Enterprise, etc. In 1940, the last of the F3F series aircraft were replaced by Wildcats aboard the fleet’s carriers. The F3F series continued to be used at Naval Air Stations as trainers and utility aircraft. By then, the colorful schemes were gone, and the F3Fs carried the blue-grey over grey scheme. I built this kit in the early 1970s, when it came in a Monogram box. I remember the kit-- the working landing gear was a little tricky to assemble, but it did work. This version of the kit comes is a big, bright box, with a hinged lid. The bottom of the box has a section of carrier deck printed on it, to serve as a display base. 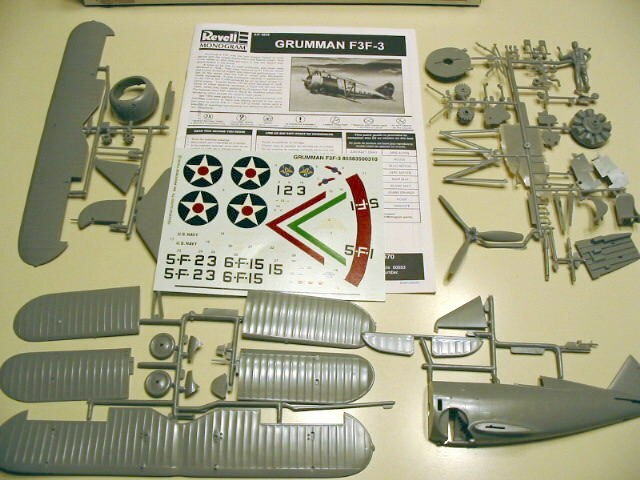 The kit consists of 69 parts, including a standing pilot figure. The kit has raised panel lines, and rivets. They would be a bit much on a 1/72 scale model, but look OK on a 1/32 scale kit. The moldings are generally free of flash, with the only place that is really affected by it being between a couple of sprues. The model’s neatest feature was the working landing gear. The model has a gear assembly behind the firewall. The gear is operated by pulling the prop shaft out and then turning it to retract or extend the gear. The instructions also mention the option to assemble the gear with glue, if you want a more sturdy fixed gear. The cockpit is made up from five pieces: A floor, seat, stick, rudder pedals, and instrument panel. There is no sidewall detail in the fuselage, and the instructions tell you to paint the inside of the fuselage black. The canopy is moveable, so you can close it to help hide the missing detail…. Each wing is made from two pieces, with upper and lower halves. The top wing has separate one-piece ailerons. Typical of kits from this era, the wings have overdone rib detail. A nice touch is that the instructions for optional rigging are called out during the mounting of the wings. The instructions recommend the use of thread or monofilament for the rigging. The instructions are a 16 page booklet. They are a combination of pictorial and written instructions. Colors are called out in generic names- red, blue, silver, etc. The last three pages include multiple profiles showing the painting and markings for the four different aircraft included on the decal sheet. You can do three aircraft with red tails from VF-5, from the USS Yorktown, including the squadron commander and aircraft 2 and 3 from the first section. The fourth decal option is for the aircraft on the box top, from the USS Enterprise. Conditionally Recommended. This kit is, in many ways, a scaled up 1/72 scale model. If not for the working landing gear, it would be very similar to a 1970s –era 1/72 scale kit, just a good bit bigger. As such, it would make a good beginners model. It is not in the same league, detail-wise, as the newest 1/32 releases, in fact, it isn’t even close. But, it is the only F3F in the scale, and it is inexpensive. I’ll build mine, and I’ll play with the landing gear a few times before putting it on the shelf….. ! Review kit courtesy of the Cape Cod Scale Modelers Model Show kit raffle. All I had available was the kit instructions. 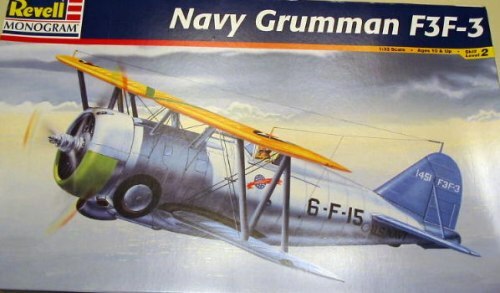 Squadron/Signal has an “In Action” title on the Grumman Biplane fighters for those looking for more information and pictures.